In the last fifty years in the United States, young adults have undergone a startling transformation. In 1960, 2/3 of all American men and 77% of American women had left home, finished school, married, had a child, and were financially independent. By 2010, these five things were true of only 28% of men, and 39% of women. These figures are symptomatic of cultural and economic changes around the world—not just in the United States, but in nearly every advanced economy. They are exacerbated by a mysterious lack of purpose, and a widespread anxiety among both young and older adults. How this all came to be is arguable; but the good news is that there is something that colleges and universities can do to correct the situation. That’s the argument of today’s guest, Tim Clydesdale, Professor of Sociology at the College of New Jersey, and author of two important books about American undergraduates. In The First Year Out: Understanding American Teens After High School, Clydesdale developed some unsettling conclusions—at least for parents and professors—about what college students actually learned in their first year of college. 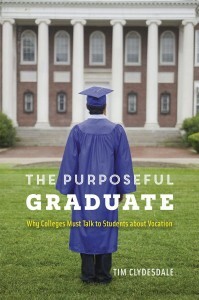 Now in his latest book The Purposeful Graduate: Why Colleges Must Talk to Students About Vocation, Clydesdale brings good news: a deliberate attempt to talk about the purpose of human life improves the academic and social life of students while in college, improves the subsequent lives of college students, and also makes colleges more pleasant places to work in for both faculty and staff.